Follow on Envato Portfolio & new releases! Follow on Twitter Item Updates and News! Follow on Facebook Latest news! Subscribe on YouTube New video tutorials! 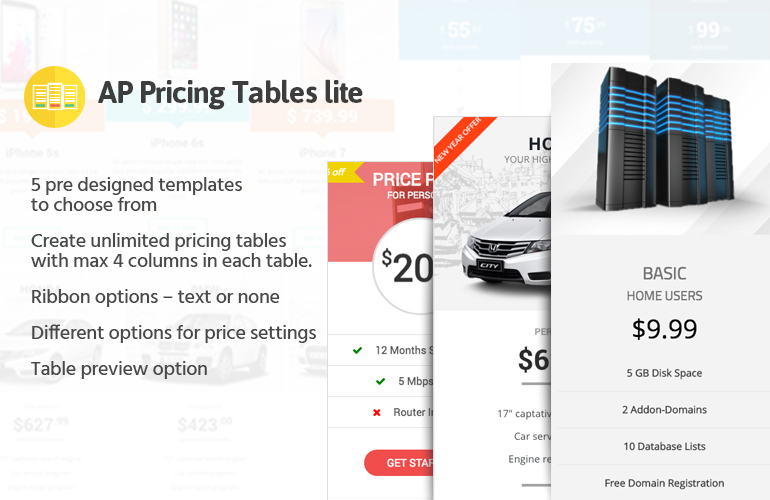 AP Pricing Tables Lite is a feature-rich WordPress pricing table plugin with an intuitive interface. It offers 5 predefined templates with various options. With this easy-to-use plugin, even non-coder can design a stunning pricing table in no time. This tool allows you to create unlimited pricing table with upto 4 columns addition. Besides, you can define column border radius, column space, column width, configure ribbon for each column and much more. * 5 pre designed templates to choose from to create pricing table instantly. * Create unlimited pricing tables with upto 4 columns in each table. – Anyone can use it, its as easy. – Get free updates for lifetime. © Copyright 2019 Access Keys - All Rights Reserved. Hey Buddy!, I found this information for you: "Responsive Pricing Table Builder Plugin for WordPress – AP Pricing Tables Lite". Here is the website link: https://access-keys.com/wordpress-plugins/responsive-pricing-table-builder-plugin-wordpress-ap-pricing-tables-lite/. Thank you.